"Thank you Anne Thorner Stack for being my great Aunt and bringing me together with the Barbara Toby Stack and Ellen Stack and Claire Glovin and Randy and the rest of my new/old family yesterday!" Hi Barbara and Ellen, Everyone loved Anne. I know my mother felt so close to her and loved her like a sister. Of course, Bebe kept in close contact and, I, via Bebe. She will be missed. She had a long, healthy life and was most fortunate to have two caring daughters, a great son-in-law and 2 beautiful granddaughters. Ellen, As you know, I loved your mom unconditionally. She was always “there” for Michael and me. She always made us feel special. And she lived her life with courageous spirit and a generous heart. She may be gone, but won’t be forgotten. Very sorry to learn from Susan about your mother’s passing. We always knew how much she meant to you and Barbara; how strong a positive role she played in your lives. Your mother also was important to Susan and me. She was bright, capable, wise and kind. It was no accident that we always wanted to spend time with her whenever we went back to Dover. She created strong, warm memories for all of us. As a good woman, she will always be with us. So sorry to learn from Susan today about your mother’s passing. As important as she was to you and your sister, she held a special place in the lives of Susan and me. First, she was the most sensible, capable and brightest person we knew when we were growing up. And when we thought we had grown up, she showed us her wisdom. We were all lucky to have had her presence in our lives. Please accept my deepest sympathy. My thoughts are with you at this difficult time. Our mother, grandmother, cousin, aunt, friend, Anne Thorner Stack, was a woman of principle. She knew what was important, lived it, and spoke of it. I grew up tutored in honesty, above all, and in justice, and in kindness. Anne taught us what it meant to be ethical, trustworthy, and trusted. Thrift and practicality ranked over decoration, and Anne chose classic, enduring styles. This is not to say that mother was not a lover of beauty. Her aesthetics embraced language, music, dance, fashion, home furnishings and the color palette pink and green. She enjoyed many sorts of music, opera, museums, and books. Mother had a fabulous memory both for her own experiences and for what she was wearing at any important moment. It was as if every story came with a fabric swatch and a fashion synopsis. Today Ellen and I are wearing mummy’s scarves in tribute and with confidence that she wouldn’t want to see us looking drab. Anne was a hard worker both by necessity and preference. She valued a job well-done, and done to completion, a garment well-made, an outfit well-put together. Anne aspired to be a good American, a good Yankee. She loved New England and grew to love Texas. Anne had a deep love of this country and always voted. She was pleased, indeed, to live to vote for Barack Obama. Anne always made a point of getting to know her neighbors. Anne embraced all peoples. As I child I spent a great deal of time with the Yankee, French Canadian, Greek and Jewish neighbors who surrounded us. Anne was a Traditionalist with the ability to reconsider and change. Our mother was raised by eastern European immigrants, grew up speaking Yiddish, French and English. Along with the entire Dover congregation, she moved from orthodoxy in various degrees and discreet steps to Reform Judaism. She overcame the prejudices of her generation to embrace goodness and people before categories. And because of this we all felt we had her support and felt secure in her love. Anne had a love for her forbears, heritage and family history. These accompanied Mummy’s love of family, which reached backwards to her grandparents, parents, aunts and uncles; and forward to each new family member and the next generations, which she was so pleased to have been able to see and meet. Over the years she said many goodbyes and welcomed many new members of the family. During the past few years Anne reminded us from time to time that the cost of sticking around and being able to see how we all turned out, involved a lot of very hard work and that being very old was not for sissies. We must face the future bravely, take all the hard knocks, and come out better men and women. We must all do our best. There is a place for everyone, only we must find it. My mother moved to Texas to be with us 10 years ago. She made up her mind to adapt to her new home. She made friends, playing mah jongg and bingo and especially enjoyed really getting to know Rose and Dori. Over the last few years, when she couldn’t travel anymore, she really appreciated the visits from her nieces, nephews and adopted family members. Since March, mother was in and out of the hospital. She was well enough on Mother’s Day to leave the hospital and spent a beautiful day at my house, enjoying the garden, the family and Len’s cooking. As her health declined, she thought and talked often of her passing. We have fulfilled her wishes to be buried in Maine next to my father, her brother Irving and sister-in-law Bertha. She was pleased to know that her favorite Rabbi Lev would be here to perform the service and she was happy knowing that she would host a lunch after the service for family and friends. There was however, one wish that I did not fulfill. Anne: You know the one you are going to put me in. Anne: Yes, you could put it in the back of the van and drive me to Maine and save lots of money! Last Tuesday, after 3 emergency room visits and hospitalizations since March, mother told me she was tired and ready to go. She died peacefully less than 2 days later under the care of loving hospice nurses. She was so proud of the accomplishments of Rose and Dori and her whole family and was confident that we will all remember her and live up to the values she embraced. Anne Thorner Stack, born January 30, 1916 in Brooklyn, NY, died peacefully in Houston, Texas on May 24th, 2012, of congestive heart failure. Anne had recently celebrated Mother’s Day with her family and passed away at peace and with dignity. Anne served as valedictorian of the Biddeford Maine High School class of 1933 and worked for the next ten years in the offices of manufacturer Saco-Lowell. Then she took over her father’s shoe findings business, driving her truck to rural customers and dressing up to make calls on suppliers in Boston. During the war the Jewish USO in Portland held mixers where Anne met Lt. Isadore Stackowitz from Lewiston. She later ran into the Lieutenant in Boston’s North Station, returning from her annual trip to hear the New York Metropolitan Opera. They married in 1944. After the war the couple moved to a promising NH town, Dover. Their first enterprise was a small discount Carroll-Cut-Rate cosmetics store. Daughter Barbara was born in 1947 and Ellen, in 1950. 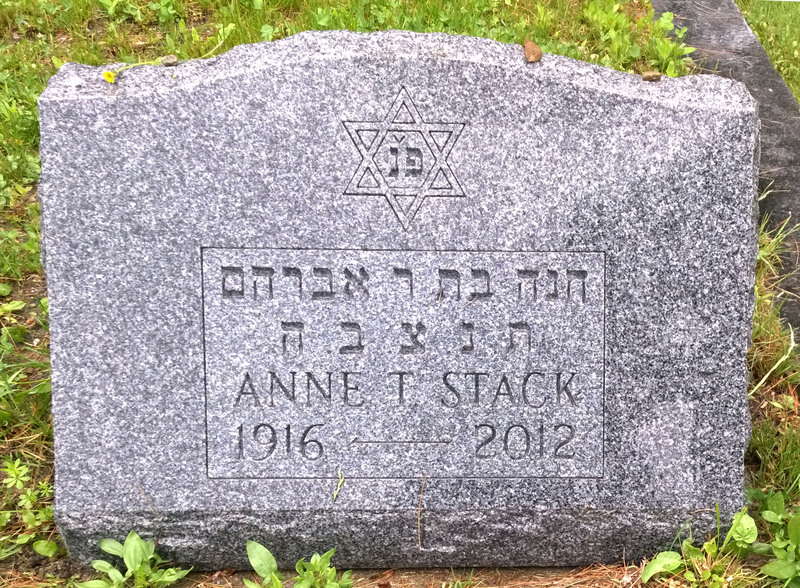 During the 1950s Anne served as the President and the Treasurer of Dover’s Temple Israel Sisterhood and later worked alongside her husband “Stack” in their shoe store on Central Avenue. Stack died suddenly in 1970. In the next decade Anne managed the office of Mort and Grace Simon’s Morton’s clothing store, and participated in its computerization. She went on to work in the Law Offices of Robert Fisher. During these later years in Dover Anne enjoyed trips to Greece, Mexico and Germany, as well as to Florida, Texas and California to visit family. In April 2002 Anne moved to Houston to live near Ellen and Len Sobel and their daughters. During this period she enjoyed new friendships, played mah jongg, and enjoyed watching her family grow up. She leaves her daughter Barbara Stack, of Berkeley, CA, and daughter Ellen Stack and son-in-law Leonard Sobel, of Houston TX, granddaughters [Niece R] and Dorian Sobel also of Houston, and many dear nieces, nephews, cousins and friends. She will be buried in Portland, Maine on Wednesday, May 30, at noon, at Mt. Carmel Cemetery, 131-299 Hicks Street. In lieu of flowers, donations may be made in her memory to Temple Israel, Dover, or to the donor’s choice. Remembrances may be posted to her Facebook page, Anne Thorner Stack. Photos from her life are also posted at http://btstack.com/Family/Anne_Stack_Gallery/index.htm. Annie Thorner was born on January 30, 1916 in Brooklyn, NY, to Abraham and Rebecca Nelson Thorner. Abraham, a small grocer, used the growing flu epidemic as a reason to move his family to Sanford, Maine, where several of Anne’s Cook family cousins lived, and to change fields, opening a tailor shop. He next moved the family eastward, toward the coast to larger Saco and then to Biddeford, which had a Jewish community and a factory-based economy. We are now ready to pass through the gateway into a glorious life. Biddeford high school has given us observation, appreciation, understanding, courage and many other loyal friends with whom we shall keep in touch all our lives. She took her own advice! Anne lived at home with her family and worked for the next ten years in the offices of manufacturer Saco-Lowell, as assistant to one of the managers, Mr. Stone, a good man who encouraged her to develop her skills and grow as a person. During this time, in the midst of the depression, the 1940 census shows her to have been the only wage earner in the family, despite which, she managed to be a disciplined saver. During this time Anne also set records as a member of the Saco-Lowell Girls’ Bowling League. As a young single woman Anne, who had begun driving at age 14, also enjoyed adventuresome road trips with her friends Betty Simensky, and Celia Stern. Destinations included Bar Harbor and Florida. During the war the Jewish USO in nearby Portland held mixers. At one such Anne was introduced to Lt. Isadore Stackowitz from Lewiston Maine. At the end of the evening she filled her car with soldiers and took them back to their base. Lt. Stackowitz told her he’d be at Old Orchard Beach that Sunday, and that she should look for him. Anne visited Old Orchard every Sunday. Then Izzy was transferred to Boston and disappeared. Anne enjoyed dressing up all her life. She made an annual train trip to see the New York Metropolitan Opera matinee performance when it toured to Boston. She would dress to the hilt with silver fox trim. On such a trip she ran into the Lt. in Boston’s North Station, and she could see that he looked at her with new eyes. He told her he was visiting his mother (she didn’t believe him). They soon renewed their acquaintance and after that he would hitchhike up to Biddeford. Anne’s mother would feed him dinner and he was the perfect gentleman, inviting Becky to the table, holding her chair, complimenting her cooking. Then he’d hitchhike back to Boston. They became engaged and then married in 1944. During the War, her father having died and her brothers and husband having enlisted, Anne took over the family shoe-findings business, A. Thorner. She enjoyed traveling to customers and especially relished dressing up to make calls on suppliers in Boston. Leather and other materials were in short supply, and she used her charms to increase her allotments. Back in Biddeford, an Atlantic coast town, Anne served as an Air Raid Warden, patrolling the streets to make sure that her neighbors completely covered their windows to create a Blackout for enemy boats and planes. Anne also enjoyed traveling and spent time with her husband at his postings in Virginia and Brooklyn. Chicago? After the war they moved to a promising NH town, Dover, where some of the Cook cousins had migrated from Sanford. Their first enterprise was a small discount Carroll-Cut-Rate cosmetics store. Their daughter Barbara was born in 1947 and Ellen, in 1950. During the 1950s Anne served as the President and the Treasurer of Dover’s Temple Israel Sisterhood and later worked alongside Stack in their shoe store on Central Avenue. The young family moved to a duplex on Ash Street next to the family of Lil and Jason Smith, and the two women established a friendship and contrasting signature colors: Lil loved blue and yellow, and Anne, pink and green. With Lil’s coaching, Anne also became quite a proficient seamstress, making many of her children’s clothes and costumes. During these later years in Dover Anne enjoyed trips to Greece and Germany, as well as to Florida, Texas and California to visit family. Anne died peacefully in Houston, Texas on May 24th, 2012, of congestive heart failure. She had recently celebrated Mother’s Day with her family and passed away at peace and with dignity.